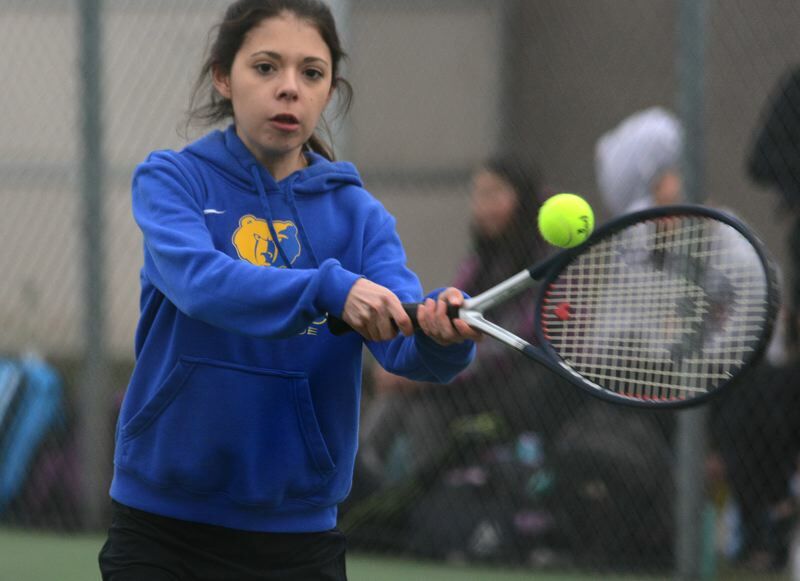 The Barlow girls tennis team pushed the reigning Mount Hood Conference champions to the final match of last Thursday's dual before giving way 5-3. The Bruins won the top three matches in the doubles ladder, tying the dual 3-3 in the late stages after Jazzy Nomie and Senny Scherler scored a straight-set win in the No. 3 spot. Barlow gained the upper hand for the first time when Nomie went up high at the net for a put away. Scherler followed with an ace to claim game point and a 5-4 lead. The Bruins would earned quadruple set-point in the next game, highlighted when Clackamas hung up a lob shot that appeared like it would fall on its own side of the net. Instead, the ball clipped the tape and forced Nomie to make a late adjustment at the net to send it back over and win the point. 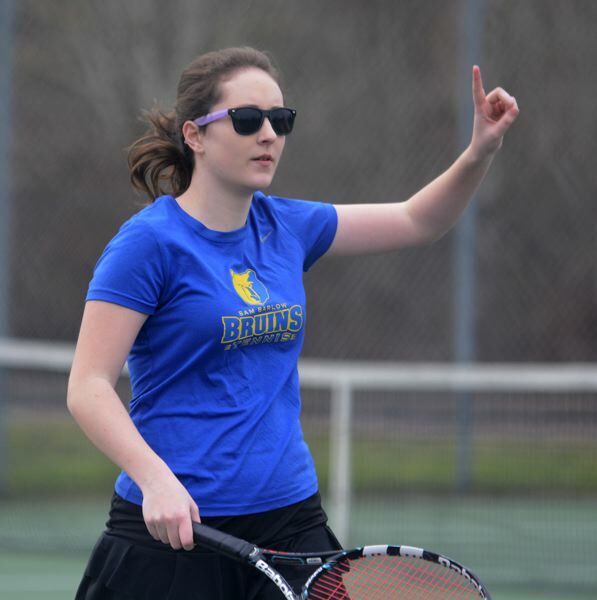 The Bruins stayed a step ahead through most of the second set, converting match point on its second opportunity when Scherler hit a deep ball that Clackamas returned into the net. The win left the team dual up to the No. 4 slots each won by Clackamas. That included a doubles match that stretched past sunset with the stadium lights from the football field across campus supplying enough of a glimmer for the players to get through the last few games. "You had to trust you instincts, and just go with what we had been doing the whole time," Clackamas rookie Heidi Thiele said. Barlow's duo of Hannah Brown and Claire Paskett turned back four consecutive set points early in the match. Brown kept the duo alive by hitting back-to-back shots at the net, the last one being a spinner that bounced twice before either Clackamas player could react. The Bruins would get four set points on their side when Paskett reached up high for a backhand winner at the net. Clackamas would stave off two points before hitting a ball long. 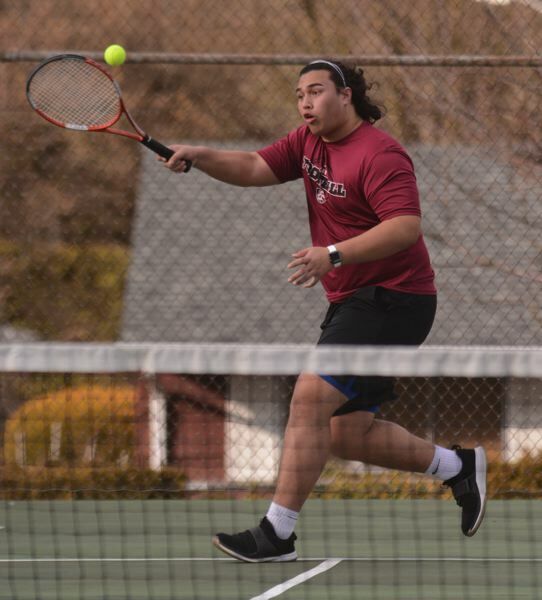 The Cavaliers' duo bounced back with a 6-0 shutout in the second set, which not only prolonged the match but also swung the dual-meet tiebreakers into their team's favor. Clackamas finished plus-16 in games won. "We just had to forget about it," the Cavs' Kate Parkins said. "It was a good time for us to comeback when they were least expecting it." Parkins and Thiele would go on to claim the third set 6-2. 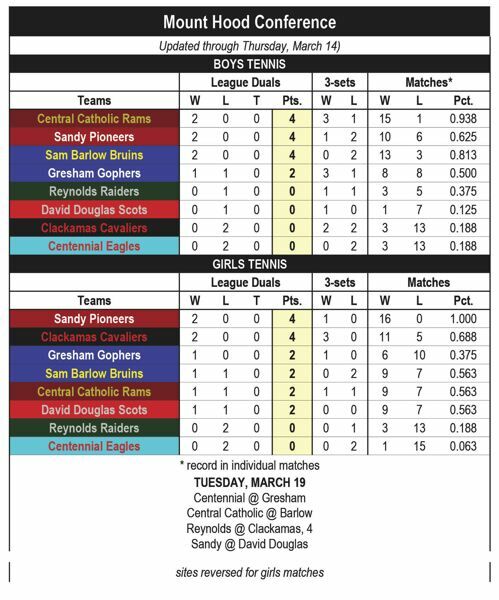 While Clackamas was working toward a sweep on the singles courts, Barlow kept pace early with straight-set wins at the top of the doubles ladder. Olivia O'Halloran and Ainsley Pate forced a first-set tiebreaker in No. 1 doubles, and scored the first three points of the extra session for a lead they would never surrender. "That tiebreaker was really important," Pate said. "We wanted to get it done and stay mentally strong." The Barlow pair stayed a step ahead throughout the second set to close out the 7-6, 6-4 decision. "We didn't want to be cautious. We wanted to play hard ball and send the ball down the line," O'Halloran said. On the adjoining court, Barlow teammates Katelyn Chung and Shania Nair overcame an early 3-0 deficit to win at No. 2 doubles. "We had to change our mindset and play as if every point mattered," Nair said. "We started placing the ball well and making good judgments." The premier match of the day saw Clackamas sophomore Elise Kang score a 6-4, 6-4 win in No. 1 singles, avenging a loss to Barlow's Grace Maxey in last year's district final. Kang trailed by a game midway through the second set, but hit a big forehand down the line that proved untouchable to break serve for a 5-4 lead. She ended it on her second match point, driving Maxey into the far right corner before hitting a pin-point winner to the other side. "I got to match point and didn't want to go for it too much. I was just trying to force her into a mistake," Kang said. "Last year's result motivated me to work harder and harder." This story is slated for our Tuesday, March 19, print edition.